Staff Sgt. Robert J. Miller, 24, was killed in action Jan. 25, 2008 while conducting combat operations near Barikowt, Afghanistan. He was a Special Forces weapons sergeant assigned to Co. ‘A,’ 3rd Bn., 3rd Special Forces Group (Airborne). On Sept. 9, 2010, White House officials announced Staff Sgt. 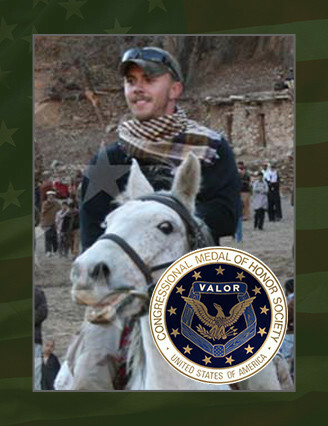 Miller would be posthumously awarded the Medal of Honor by the President, at the White House on Oct. 6, 2010. The Medal of Honor is the highest award bestowed an individual for acts of heroism. The award was presented to the family. Miller was born on October 14, 1983 in Harrisburg, Penn. He grew up in Wheaton, IL where he attended Wheaton North High School. He attended one year at the University of Iowa and then volunteered for military service. Miller enlisted as a Special Forces trainee in Iowa City, Iowa on Aug. 14, 2003. He graduated from Infantry Basic Training and Airborne School at Ft. Benning, Ga., Jan. 6, 2004. Miller graduated from the Special Forces Qualification Course Sep. 26, 2004, and the Special Forces Weapons Sergeant Course Mar. 4, 2005. He received the Special Forces Tab and was promoted to Sgt. after graduating from the Special Operations French Language Training Course, Sep. 30, 2005. Miller was assigned to Co. ‘A,’ 3rd Bn., 3rd Special Forces Group (Airborne), Ft. Bragg, N.C. In 2006, Miller deployed with 3rd SFG (A) in support of Operation Enduring Freedom, earning the Army Commendation Medal for valor for his display of courage. He was also promoted to the rank of Staff Sgt. In October 2007, he deployed for a second tour in Afghanistan, where he served as the Weapons Sergeant for his team. His military training includes: Warrior Leader Course; Basic Noncommissioned Officer Course; Basic Airborne Course; the Survival, Evasion, Resistance and Escape Course; Special Forces Qualification Course; Special Forces Heavy Weapons Course; and the U.S. Army Ranger School. His awards and decorations include: Bronze Star Medal, Purple Heart, Meritorious Service Medal, Army Commendation Medal for Valor, Army Good Conduct Medal, Afghanistan Campaign Medal, the Global War on Terrorism Expeditionary Medal, the Global War on Terrorism Service Medal, the Noncommissioned Officer Professional Development Ribbon with numeral 2, Army Service Ribbon, NATO Medal, Parachutist Badge, Special Forces tab and Ranger tab and a Congressional Medal of Honor. Staff Sgt. Miller is survived by his parents, Philip and Maureen Miller, his brothers, Thomas, Martin and Edward, and his sisters, Joanna, Mary, Therese and Patricia, all from Oviedo, Fla.